14,000-lb. vehicles have wheelbases that need specialized equipment to keep them safe and supported. Our extended runways prevent wear and tear on your vehicle. Driving onto the runway is safe and simple for vehicles of all sizes. Dual-hub cable sheaves reduce stress, fatigue and wear. Huge 10.5” diameter cable sheaves within the runway and cross tubes combine with massive 2.25” diameter sheave axles. This dramatically improves cable wear and critical component lifespan, which means less money in service-related expenses down the road. 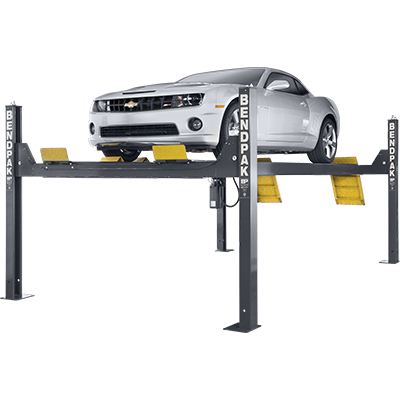 This lift features four, 1/2” diameter, 6 x 25 stainless-steel lifting cables that have a breaking strength of over 14,000 lbs. each. This aircraft-quality cable was specifically designed for lifting applications and provides a great balance between abrasion resistance and fatigue. 10" x 12" base plates provide a solid foundation for every 14K capacity four-post lift. Optional 7,000-lb. capacity rolling jacks (model RBJ7000) make a great addition. RBJ7000 bridge jacks are used to raise the front or rear portion of a vehicle off the runways, allowing operators to perform efficient wheel and brake service. A pair of jacks allows the entire vehicle to elevated. Each jack has telescoping arms with frame contact pads that can be extended over the runways and positioned under vehicle lifting points. Telescoping rail supports accommodate adjustable runways for different tread widths. Each jack features three safety-lock positions, as well as stackable truck and van adapters for increased lifting height and better access to frame contact points on high ground-clearance vehicles. The jacks come equipped with a commercial grade air-hydraulic pump requiring a maximum pressure of 125 PSI and 10 – 20 CFM.